Congratulations to Katherine Hannaford who has been awarded the UNIMA Australia Lorrie Garner Scholarship for 2016! From May 30 to June 19, 2016 she will be travelling in the United States of America to Atlanta, Georgia for a return visit to the Center for Puppetry Arts, Texas to attend for the second time, “Beyond the Sock: Puppetry for Film and Television workshop” and Los Angeles to visit the Stan Winston School of Character Arts. Katherine is a professional puppet builder, emerging puppeteer and she is currently teaching Puppetry as a year-long elective at the high school in NSW where she works at full time as Teacher Librarian. If you’d like to join Katherine at Beyond the Sock (June 7-11, Texas), registration is still open until May 24, 2016. 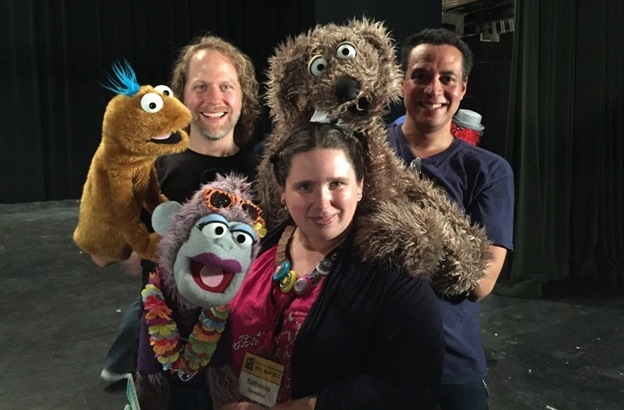 Workshop participants get to design, build and perform hand and rod puppets while learning from Muppet and Sesame Street performers Peter Linz and Noel McNeal (shown in the photo with Katherine in 2015) and puppet builder Pasha Romanowski from Project Puppet. For those interested in the Lorrie Gardner Scholarship, the next one will be offered in 2018 to the value of $2500 AUD. The scholarship is only available to UNIMA Australia members who have been continuous for at least 2 years before applying. To allow for new or expired membership, UNIMA Australia is giving the opportunity to join/renew before the 30th of April, 2016. If you are already a current member, you just need to keep updating your membership. This entry was posted in News, Uncategorised and tagged Beyond the Sock, Lorrie Gardner Scholarship, Membership, Puppeteer, Stan Winston School of Character Arts, UNIMA Australia, USA, Workshop on Wed 27 Apr 2016 by Oz. Error: Error validating access token: Session has expired on Tuesday, 26-Mar-19 01:31:00 PDT. The current time is Tuesday, 23-Apr-19 05:00:35 PDT.